Other than in name, Bismarck motorcycles has little to do with the famous chancellor or the famous battleship. Bismarck was a noted producer of bicycles and sewing machines at the turn-of-the-century like many other industrial companies that eventually went on to produce motorcycles. 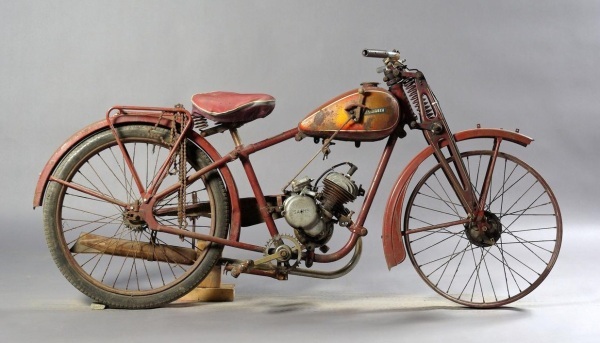 Motorcycle production began in 1904, and in 1906 an almost identical copy of a Bismarck showed up as a Husqvarna and is allegedly thought to be the basis of that famous Swedish brand (which is ironically now owned by German brand BMW). WWI Interrupted the production of motorcycles as it did for almost all manufacturers involved in the conflicting countries. Following the war, Bismarck returned to motorcycle manufacturing but concentrated on small displacement machines. Bicycle roots continued to be a big element of design as evidenced particularly in the frame. The period following world war one and up until 1931 is somewhat unclear regarding Bismarck. There are reports that they ceased production during this period of time, while other reports claim that they produced bicycles and small displacement "motor bicycles" which included engines and components from other suppliers such as Fafnir. Regardless, they emerged more prominent just in time to run into WWII, which caused another interruption in production. Once again, Bismarck survived and resumed motorcycle production in the late 1940s. Unlike many other manufacturers, they did not just dust off a model or a design used from before the war, but developed new components including a new modern front suspension. This helped the new model to stand out, but was obviously an expensive undertaking. Bismarck concluded that bold advertising would be part of the key to success, and in 1950 they decided to launch a very bold publicity stunt. They would take an unmodified 125cc two-stroke single Bismarck, and ride it unsupported from Munich to Cape Town in South Africa. This would be quite the accomplishment today, much less in 1950. The rider was a mechanic from the factory who simply volunteered! The trip was reportedly accomplished without mechanical failure or significant troubles of any kind. The advertising worked as planned, and sales were boosted by the adventure. However, the boost was not enough as all of the motorcycle manufacturers ran headlong into the emergence of the small cheap automobile, economic malaise, and dwindling financing. Bismarck was forced to close their doors in 1956. A museum celebrating the marque exists today in Radevormwald, Germany.